Need something new to Power Up 2017? Try Power Souping your way to a super easy, yet powerful meal solution. My Debloat Me Soup is a Hollywood favorite among my celebrity clients! This isn’t your grandma’s plain jane pea soup. The secret within this power-soup is the parsley, a natural diuretic that helps prevent water retention. 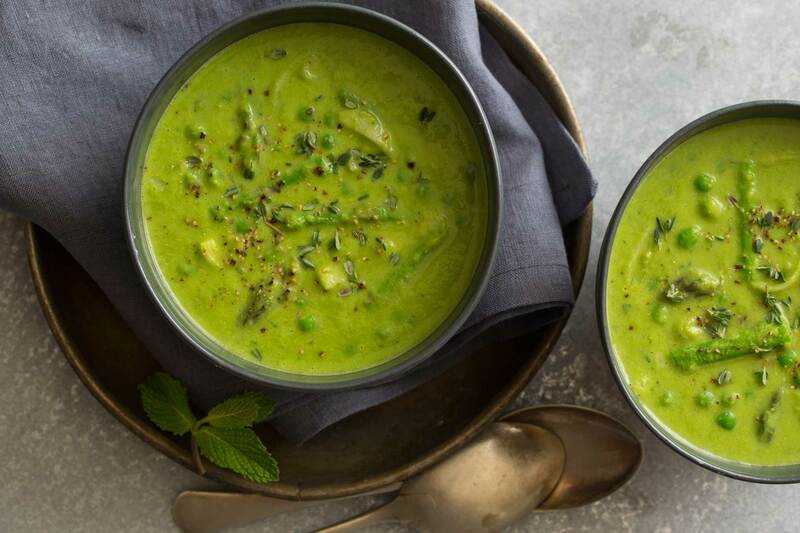 Along with protein-rich green peas and all types of energizing B vitamins, this bright green de-puff potion is your red-carpet-ready weapon of choice. Heat the oil in a large pot over medium heat. Add the leeks and sauté for 4 minutes, until softened. Add the broth and and bring to a simmer. Stir in the peas and asparagus and simmer, covered, for 3 minutes longer. Carefully place half of the soup in a high-powered blender and puree until smooth, then return it to the pot. Add the parsley and stir well to combine. Season with salt and pepper to taste and serve. Tips: It tastes great hot or chilled. Super portable. Just jar it and go!